HBO had an up-down ride Thursday with the announcement of 2018’s Emmy nominations. 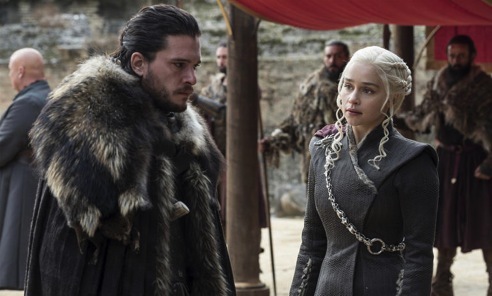 After a year of ineligibility, the network’s Game of Thrones returned as the top-nominated program with 22, edging NBC’s Saturday Night Live and HBO’s Westworld with 21 nods apiece. But after an unprecedented 17-year winning streak, HBO slipped to second place behind online streaming Netflix for the most overall nominations. It was close, with HBO slipping just slightly from 110 to 108 nominations while Neftlix upped its total from last year’s 91 to 112. Despite the closeness, this is another sea change in a competition where the once dominant Big Four broadcast networks are no longer expected to lead the pack. NBC did, however, up its year-to-year total from 63 to 78 nominations in finishing a solid third. In contrast, Fox fell from 20 to just 16 Emmy nods. Netflix weighed in with four programs snaring 10 or more Emmy nods, led by The Crown with 13. Its other double-digit performers were Godless and Stranger Things (each with 12); and GLOW (10). FX scored big with The Assassination of Gianni Versace: American Crime Story (18 nominations) and Atlanta (16) while Hulu again finished near the top of the charts with the second season of The Handmaid’s Tale (20 nods). And Amazon made a major impression with The Marvelous Mrs. Maisel, which had 14 nominations. The other programs with 10 or more nominations were HBO’s Barry (13); NBC’s Jesus Christ Superstar Live In Concert (also with 13); NBC’s The Voice and VH1’s RuPaul’s Drag Race (10 apiece). Programs had to air between June 1 and May 31 to be eligible. This left out one of HBO’s heaviest hitters, Veep, after production on its final season was delayed by star Julia Louis-Dreyfus’ recovery from breast cancer. Veep had won three consecutive Emmys as Best Comedy Series while Louis-Dreyfus had a six-year winning streak in the Lead Actress in a Comedy Series category. But HBO’s Game of Thrones wasn’t on last year’s playing field, so it’s something of a wash. And Netflix’s ineligibles included previous Emmy nominees House of Cards and Master of None. The marquée catégories of best drama and comedy series were without one usual and eligible suspect. ABC’s Modern Family for the first time missed the comedy series cut after winning in this category from 2010 to 2014. This year’s nominees are Atlanta, Barry, GLOW, The Marvelous Mrs. Maisel, ABC’s black-ish, HBO’s Curb Your Enthusiasm, Netflix’s Unbreakable Kimmy Schmidt and HBO’s Silicon Valley. Also nominated last year, Atlanta looks like the prohibitive favorite. The Best Drama Series contenders include FX’s The Americans for its final season. Also in this mix are The Handmaid’s Tale, Game of Thrones, The Crown, Stranger Things, Westworld, and NBC’s This Is Us. The defending champ, Handmaid’s Tale, is a likely repeater, particularly in the #MeToo era. But The Americans, which has never won, could be a strong dark horse. The Best Limited Series field is Godless, The Assassination of Gianni Versace: American Crime Story, National Geo’s Genius Picasso, Showtime’s Patrick Melrose and TNT’s The Alienist. The probable winner here is Versace. Emmy’s Variety Talk Series finalists again are absent NBC’s The Tonight Show Starring Jimmy Fallon. Jimmy Kimmel and Stephen Colbert, who directly compete against him, again made the cut along with TBS’ Full Frontal with Samantha Bee, CBS’ The Late Late Show with James Corden, HBO’s Last Week Tonight and Comedy Central’s The Daily Show with Trevor Noah. John Oliver’s Last Week appears to be in the driver’s seat after winning this category last year. Lead Actress in a Drama Series: Elisabeth Moss (The Handmaid’s Tale); Claire Foy (The Crown); Keri Russell (The Americans); Evan Rachel Wood (Westworld); Sandra Oh (BBC America’s Killing Eve); Tatiana Maslany (BBC America’s Orphan Black). Lead Actress in a Comedy Series: Tracee Ellis Ross (black-ish); Rachel Brosnahan (The Marvelous Mrs. Maisel); Allison Janney (CBS’ Mom); Issa Rae (HBO’s Insecure); Pamela Adlon (FX’s Better Things); Lily Tomlin (Netflix’s Grace and Frankie). Lead Actor in a Drama Series: Sterling K. Brown (This Is Us); Milo Ventimiglia (This Is Us); Ed Harris (Westworld); Matthew Rhys (The Americans); Jeffrey Wright (Westworld); Jason Bateman (Netflix’s Ozark). Lead Actor in a Comedy Series: Donald Glover (Atlanta); Bill Hader (Barry); Anthony Anderson (black-ish); Larry David (Curb Your Enthusiasm); Ted Danson (NBC’s The Good Place); William H. Macy (Showtime’s Shameless). *** It’s hard to go wrong with Allison Janney. This will be her 14th Emmy try and she’s won seven times previously. Not as fortunate are Anthony Anderson and Sandra Oh, both of whom have gone hitless in five previous at bats and hope to finally make contact with their sixth nominations. *** Nothing is likely to ever touch ABC’s Roots for the most Emmy nominations in a single year. In the Miniseries/Limited Series category, it had 37 in 1977. The runner-up on this all-time list, ABC’s NYPD Blue, earned 27 nods in 1994. *** ABC’s banished Roseanne managed to snare two nominations, for multi-camera picture editing and for Laurie Metcalf’s portrayal of Jackie Harris. She won three times for that role in the original Roseanne. *** First-time Emmy nominees fittingly include Megan Amram for the web series An Emmy for Megan. Among the name brand notables are John Legend (the title role in Jesus Christ Superstar Live In Concert), Ricky Martin (Assassination of Gianni Versace) and at long last the very deserving Kenan Thompson for Saturday Night Live. *** One is the loneliest number for these high-profile series, all of which received just a single Emmy nomination: America’s Got Talent, Ballers, The Blacklist, Empire, How to Get Away with Murder, Modern Family, Scandal, South Park. The 70th annual prime-time Emmy Awards ceremony will be telecast Sept. 17th on NBC, with hosts Colin Joost and Michael Che.